THE MAY DAY BANK HOLIDAY 7 May 2001 was an idyllic sunny day. Here are some pictures captured on a drive through some of my favourite places in and around Manchester. 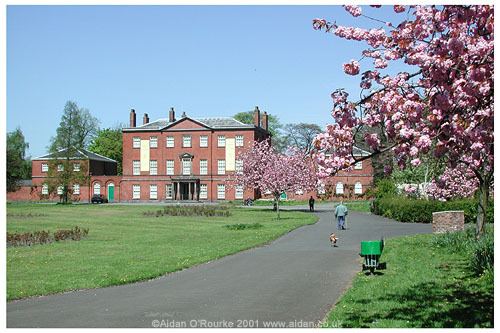 PLATT HALL is situated in Platt Fields Park, around 3 miles (5km) south of Manchester city centre. The Hall, once a private residence, now houses a costume museum. The spring blossoms bring a bright pink pastel tone to the scene. Though the weather is perfect, the park is mostly quiet. The only person visible in the picture is a man walking his dog. 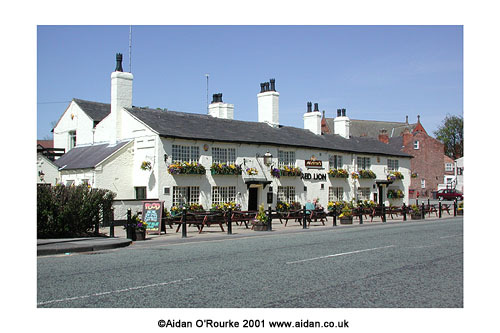 THE RED LION pub in Withington is one of Manchester's oldest and most traditional pubs. Many older pubs were demolished in the Victorian era to be replaced by bigger, grander buildings. This one survived however - its low beamed ceiling harks back to pre-industrial times. In 2001 the exterior was renovated with new tables, benches and flowers outside. Anyone fancy a pint of Boddingtons? 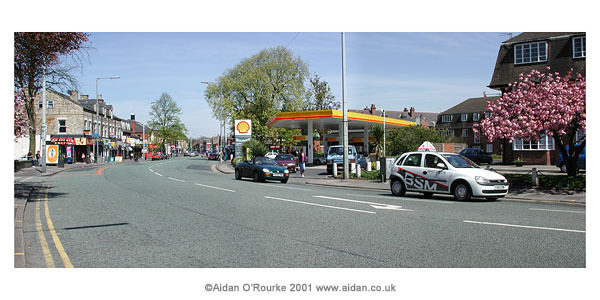 DIDSBURY VILLAGE is mostly free of traffic on the May Day Bank Holiday 2001. We are looking from the corner of Dene Road directly up the village. The Shell garage is on the right and to its right Viceroy Court, where I used to live. A tree with pink spring blossoms is visible on the right. A quiet traffic day makes for good conditions for learner drivers. An Opel Corsa of BSM (British School of Motoring) passes on the right. Behind it is a dark green convertible MGF - It's perfect weather for open top driving. THE THREE SHIRES PUB in Underbank, Stockport, is a genuine medieval pub, one of many historic attractions the town 6 miles (10km) south east of central Manchester. The plaque reads: "Built c 1580 Cheshire half-timbered town house formerly belonging to the Leghs of Adlington Hall. Shopfront inserted in 1824. At various times has housed a confectioners, bakehouse, surgery, solicitors, restaurant and wine bar." The plaque was put up by the Metropolitan Borough of Stockport. 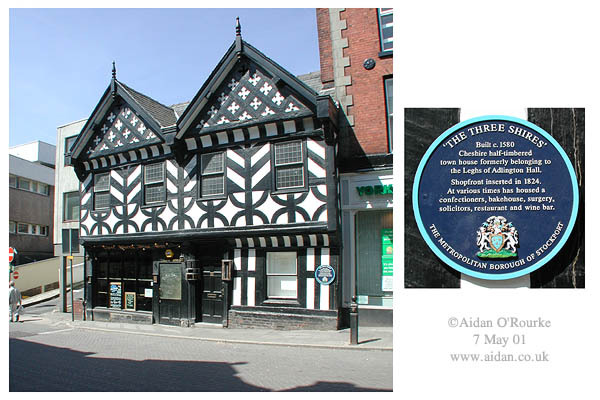 The 'three shires' referred to in the pub name refer to the ancient counties Lancashire and Cheshire whose boundary runs along the River Mersey in Stockport, and Derbyshire, to the east of the town. THE WHITE LION PUB, Underbank Stockport makes a magnificent sight on a sunny day, with its five gables, white corner tower and half timbering. The black and white half timbering is a feature of many Victorian buildings, harking back to medieval houses and recreating a sense of 'olde England'. Sometimes it's difficult to tell the genuine medieval building from the Victorian imitation one, but no medieval pub would be built on such a grand and imposing scale as this one. WERNETH LOW is one of my favourite spots in the Manchester area, and a place I return to again and again. With the clear sunny weather on the Bank Holiday Monday 7 May 2001 I thought there would be clear visibility. As we can see, the atmosphere is a little misty in the distance. We are looking north west towards Manchester city centre. The outline of Winter Hill, north of Bolton, is just visible. Just 10 miles (16km) from central Manchester, Werneth Low retains a rural character with its farms, hedgerows and horses grazing in the fields.